Bio: Tulsi Gabbard spent her life growing up in beautiful Hawai‘i. As a teenager, she co-founded an environmental non-profit called Healthy Hawai’i Coalition, focused on educating children about protecting Hawaii’s environment. In 2010, Tulsi was elected to the Honolulu City Council, serving as Chair of the Safety, Economic Development, and Government Affairs Committee and Vice Chair of the Budget Committee. In 2011, she visited Indonesia as part of a peacekeeping training with the Indonesian Army. Tulsi was elected in 2012 to the United States House of Representatives, serving Hawaii’s 2nd District. She is one of the first two female combat veterans to ever serve in the U.S. Congress, and also its first and only Hindu member. Military Bio: Tulsi served two tours of duty in the Middle East, and she continues her service as a Major in the Army National Guard. Tulsi’s 2005 deployment was a 12-month tour at Logistical Support Area Anaconda in Iraq, where she served in a field medical unit as a specialist with a 29th Support Battalion medical company. She was awarded the Meritorious Service Medal at the end of this tour. In between her two tours, Tulsi served in the U.S. Senate as a legislative aide to Senator Daniel Akaka (D-HI), where she advised him on energy independence, homeland security, the environment, and veteran issues. While working for Senator Akaka in 2007, Tulsi graduated from the Accelerated Officer Candidate School at the Alabama Military Academy, where she was the first woman to finish as the distinguished honor graduate in the Academy’s 50-year history. Tulsi was commissioned as a Second Lieutenant and again assigned to the 29th Brigade Special Troops Battalion of the Hawaiʻi Army National Guard—this time to serve as the Military Police Platoon Leader. In 2014, our country’s failure to fulfill its promise to our veterans was starkly exposed. At the Department of Veterans Affairs (VA), veterans faced wait times of 90 days or more to see a doctor. Hawaiʻi veterans experienced the worst wait times in the country, averaging 145 days—almost five months—for a simple primary care visit. Tulsi introduced a bill called the Access to Care and Treatment (ACT) Now for Veterans Act to allow veterans not being served by the VA to get the immediate care they need from non-VA medical providers. Provisions from the bill were ultimately included in the Veterans Access, Choice, and Accountability Act that became law at the end of 2014. Tulsi has also introduced legislation to hold VA officials responsible for ensuring our nation’s veterans get the care and services they need and are not rewarded for their malpractice. Even after the VA scandal in 2014, veteran wait times have increased. The Veterans Administration Bonus Elimination Act will help to better ensure timely delivery of care to our military veterans. At the start of the 114th Congress, Tulsi launched the bipartisan Congressional Post 9/11 Veterans Caucus to provide a forum for the more than 2.8 million men and women who have returned home since 9/11. The caucus is made up of members of Congress who share the experience of this newest generation of veterans, and is focused on ensuring that the unique concerns of post-9/11 veterans are addressed and that their ideas and potential are realized. Together, the caucus has worked to pass legislation like the Clay Hunt SAV Act to help our returning service members get access to quality mental health care. Tulsi has introduced legislation like the bipartisan Veterans Entry to Apprenticeship Act to help returning veterans transition to the civilian workforce by enabling them to use their GI Bill benefits for apprenticeship programs in the skilled-trade industry. 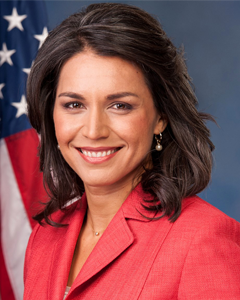 Tulsi’s bipartisan legislation to honor Filipino Veterans of World War II with the Congressional Gold Medal Act was signed in to law on December 14, 2016. The bill recognizes the service and sacrifice of the more than 200,000 Filipino Veterans who fought under the American flag during World War II. Over the past decade, there have been over 29,000 cases of child abuse and neglect in military homes. Tulsi introduced Talia’s Law, named for Talia Williams, a five-year-old who was beaten to death by her father, a Soldier who was stationed in Hawai’i at the time. Talia’s Law aims to prevent child abuse and neglect on military bases by mandating training and requiring members of the Armed Forces and civilians working in military institutions to immediately report suspected cases of abuse to State Child Protective Services. The House unanimously voted to pass Talia’s Law at the start of 2016. Talia’s Law is also included in the FY17 National Defense Authorization Act awaiting final passage.